LINIAN are delighted to announced that we have been crowned a ‘Top Product’ winner in Professional Electrician & Installer Magazine’s 2018 annual awards for a second year running! Professional Electrician and Installer is the UK’s most widely circulated trade magazine for on-the-job electricians featuring top industry news, reviews from the UK’s top tools, tests and more. The awards, selected on the level of interest and enquiries generated by Professional Electrician’s 70,000+ readership, are recognition for those manufacturers and suppliers that have made a real difference to the electrical contractor’s ability to get the job done efficiently, safely and professionally, whether this is in the form of innovative products, tools or time-saving solutions. Find out what Professional Electrician and Installer had to say about our award here. Perfected through years of development, the LINIAN Fire Clip was born out of a real need to have a faster, safer and simpler way of installing cabling. With a range of clips available, they provide a time-saving alternative for installing fire-resistant cables on brickwork, concrete, masonry, wood studs and wood beams. Unique single component, patented design eliminating the need for plugs, screws, washers etc. 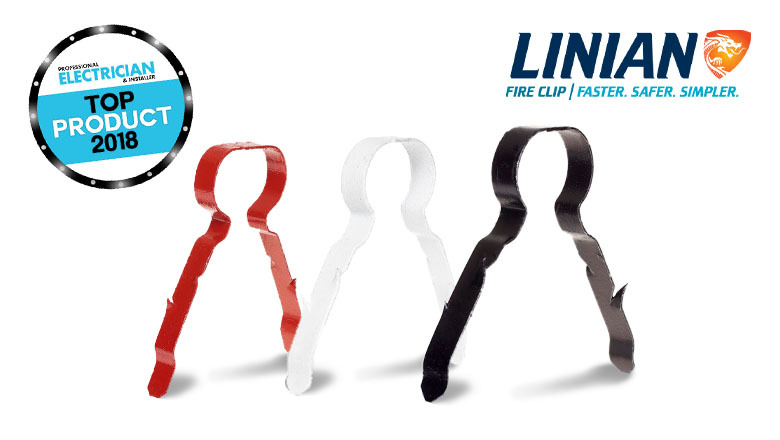 Maybe you’d like to try the LINIAN Fire Clip for yourself? If you are interested in finding out more about this innovative product or becoming a distributor, please contact us here.